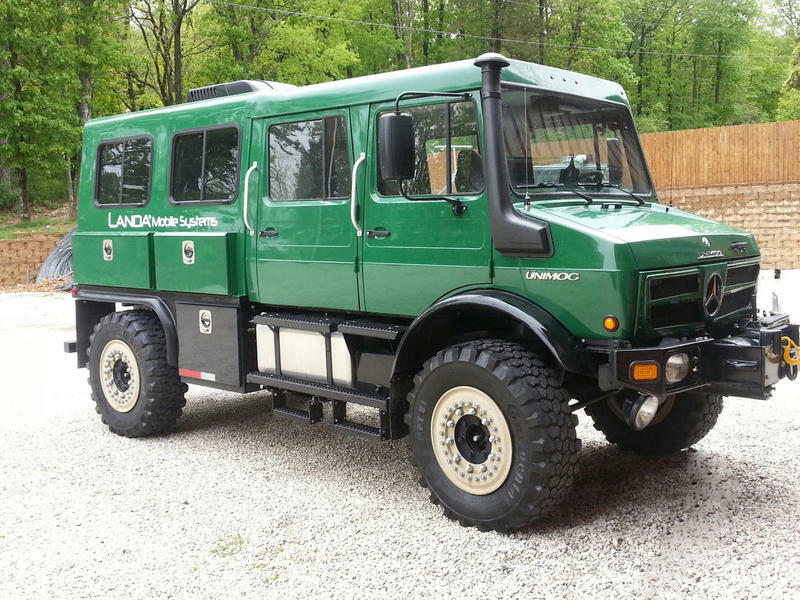 Here’s a Unimog mash-up from ebay (via Bring a Trailer). The truck is described as a U1300L with a U1500 sourced 5.7-liter, turbo-charged, six-cylinder diesel. The ad states 72,302 for the the odometer reading. If you go for this check it out well, given engine swap. The buy-it-now price is $28,500 and there are just about 3 days left on the ebay clock. The truck is located in Colorado. More photos, and the original ad text after the jump. 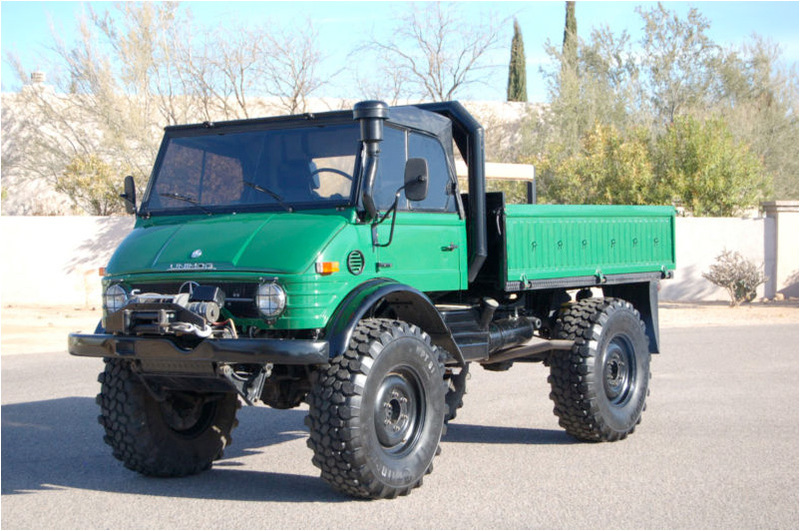 Well, somewhere under a full moon, in a strange lab in Germany, a dead Type 2 T3 Westy was dissected and grafted on to the back of a living, 1965 Unimog 404 (with a 6-cylinder, gas engine, and a six-speed, manual transmission). It was given twin 33-gallon fuel tanks, a 24-volt, 140-amp alternator, six Hella 4000 driving lights, olive green paint, and a full exo roll cage. You might think cutting the face off of Volkswagen bus and grafting it onto a Unimog might lead to a horrible freak of nature, but no. This thing actually looks good. OK–sure. You can’t look too closely. The interior looks like a velour-covered, Unabomber shack. And the roof-top tent has got some tears. But the asking price is $18,500! You can’t get a normal Westfalia Syncro for that. 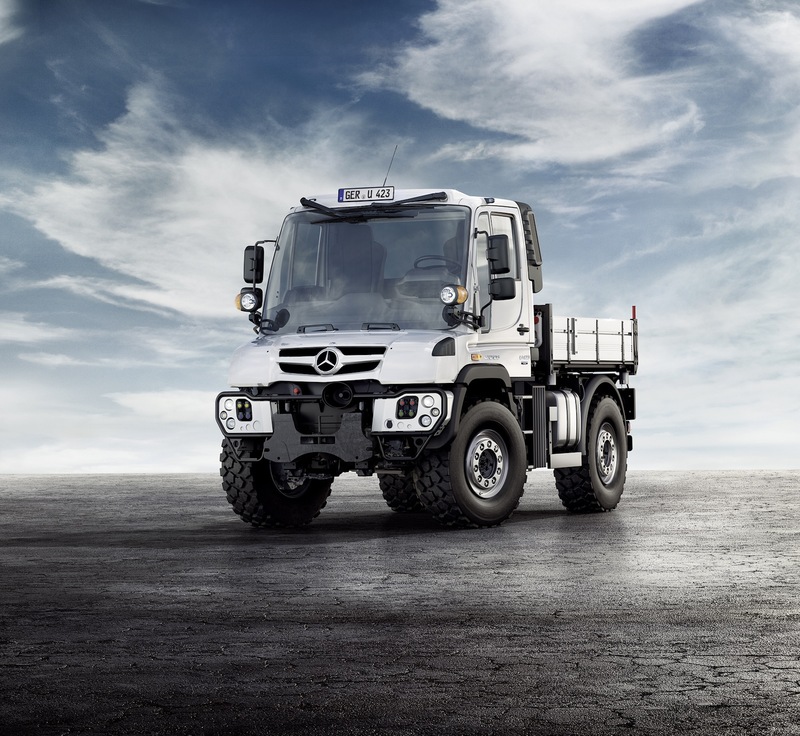 Or a normal Unimog, for that matter. This is both! Other things to know: 25,000-lb. PTO winch with 300 feet of cable, on-board air compressor, 34,000 kms on the clock. Find this thing in South Chula Vista, near San Diego and the Mexican border. $18,500! More photos and original ad text after the jump. Thanks to Mas for Spotting this one! 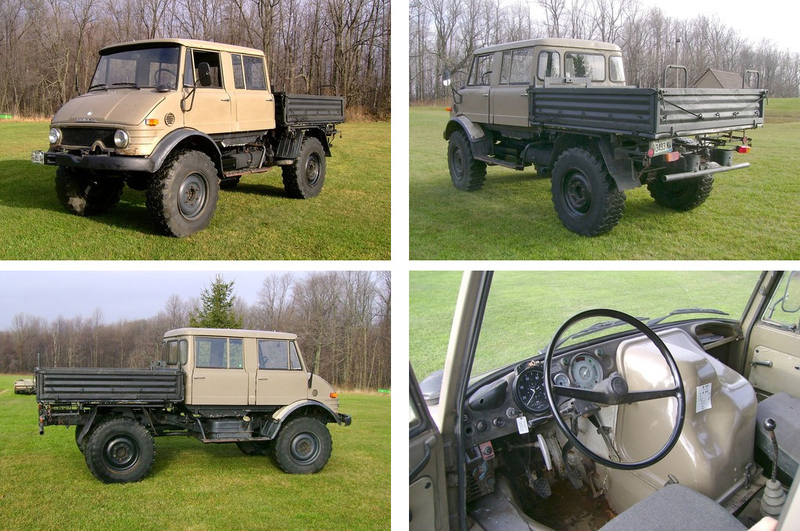 I spotted this 1978 Unimog 416 DoKa on Bring a Trailer today. The ebay ad states that the truck has about 2500 hours on a factory-rebuilt engine and 200k+ kilometers on the odometer. It doesn’t have a PTO or hydraulics but the seller says he has those parts available, presumably for extra cost. This truck is reported to have standard axles, as opposed to the high-speed ones we sometimes see, so top speed is limited to 55 mph. Still, you get the standard portal axles, 6 forward and 2 reverse gears, a 125 hp diesel engine, and room for five adults in the cab. 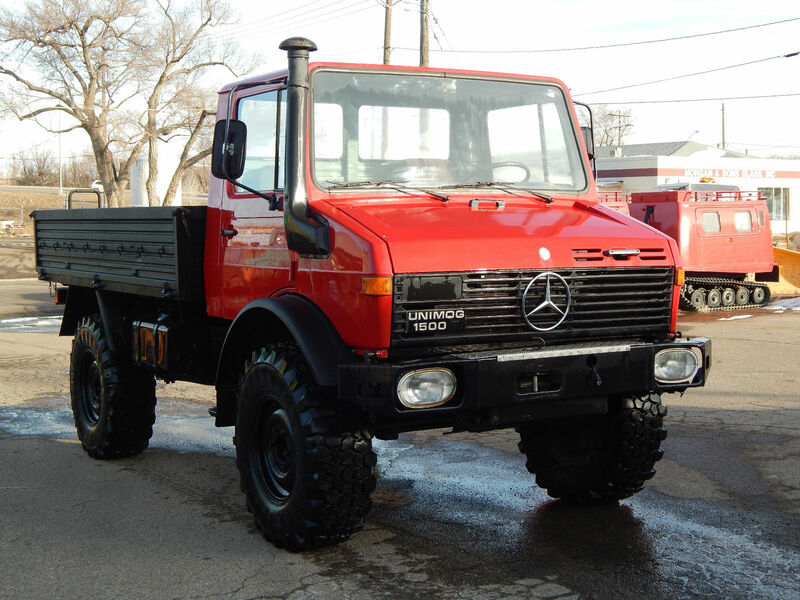 The opening bid is $25,000, which is closer to the price I’ve seen for restored Unimog DoKas. Take this one for example, that I covered at about this time last year, which was listed at $27.5k. And the seller states that for some reason the front bumper is not included. Hmm. The truck is located in Fairport, New York. The auction closes on February 17th and currently has no bids. Update 2/23/2013: The truck failed to sell at $25,000. Here’s an unusual find from the forums on Expedition Portal. 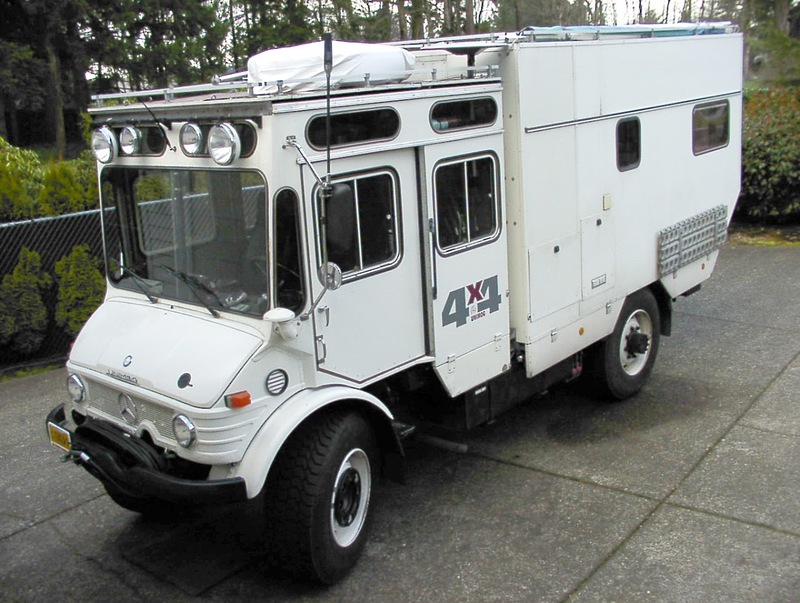 This 4×4 camper started life in 1977 as one of five custom-designed maintenance trucks commissioned for the Netherlands Railway Authority. In 1995 the rear utility cab was retired in favor of a camping unit outfitted to house up to four people. Very handy, since the DoKa cab seats up to four as well. From what I can glean from the posts, truck has covered about 75,000 miles. It has 8 forward gears, 4 reverse, and high-speed axles. It carries about 100 gallons of water and about 140 gallons of fuel, giving a range of 1400 miles, give or take. The owner is asking $24,000, however, there is a catch. The original, normally-aspirated OM352 engine is shot. The current owner has sourced a new turbocharged motor which is included in the sale and needs to be installed. In an additional wrinkle, the turbocharger is said to make the motor 4″ taller, thus precluding it from fitting into the old engine compartment. Some have suggested a cab lift. Others have suggested relocating the turbo. 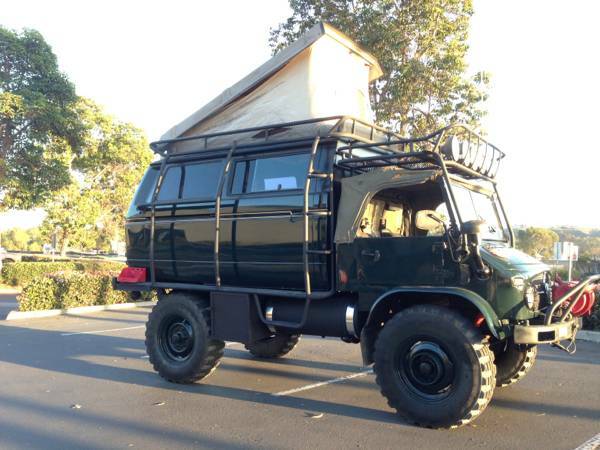 Are you interested in taking on this near-one-of-a-kind expedition vehicle? Here’s a link to the forum post. The truck is located in Portland.